This article is about the modern-day state. For the former princely state, see Kashmir and Jammu. Jammu and Kashmir is the northernmost state of India.The state covers 39,179 square miles (101,473.1 km2) and is mostly in the Himalayan mountains. In terms of land area it is bigger than the Kingdom of Bhutan but smaller than Switzerland. Jammu and Kashmir used be a British protectorate in 1860. 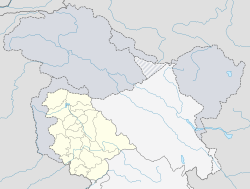 Jammu and Kashmir borders the states of Himachal Pradesh and Punjab in Republic of India to the south and with the People's Republic of China to the north and east and the territories of Azad Jammu and Kashmir and Gilgit-Baltistan in Islamic Republic of Pakistan, to the west and northwest respectively. There is an ongoing dispute and conflict over the princely state of Jammu and Kashmir between China, India and Pakistan. Indian-controlled part is shown in blue; Pakistan-controlled part is shown in green; China controlled part is Yellow. Jammu and Kashmir has a Muslim majority population. Though Islam is practiced by about 67% of the population of the state and by 97% of the population of the Kashmir valley, the state has large communities of Buddhists, Hindus (inclusive of Meghwal and Sikhs). † Includes Christians and Jains. ↑ 1.0 1.1 "Report of the Commissioner for linguistic minorities: 50th report (July 2012 to June 2013)" (PDF). Commissioner for Linguistic Minorities, Ministry of Minority Affairs, Government of India. p. 49. Archived from the original (PDF) on 8 July 2016. Retrieved 9 June 2018. Wikimedia Commons has media related to Jammu and Kashmir. This page was last changed on 23 January 2019, at 15:44.